Conveyancing is the legal process of transferring ownership of a property from one party to another, but when it comes to moving house it has a wider definition. Commonly referring to the whole body of legal-administrative work undertaken to enable a house sale or purchase to be legally valid, it is carried out by solicitors or specialist conveyancing providers. Sale of your property - Once your sale has been agreed, you should inform us of your conveyancing solicitor's details so that we can send them the relevant paperwork. Getting started - Initially the conveyancer will provide you with a formal instruction form and other documents which will enable them to gather all of the relevant details about you and your house. Once you confirm your interest in working with the conveyancer, they will proceed with the transaction. Purchase of your property - The conveyancer can also carry out all of the legal work involved in the purchase of your property. Initially, all you need to do is provide us and your mortgage broker with the conveyancer's details. They will then be able to contact the seller's conveyancer to confirm instructions. Searches on your purchase - Once your newly appointed conveyancer has received the contract documentation from your sellers' solicitor, they will be able to affect the necessary searches of the Local Authority, Water Authority and Environmental Agency. Mortgage details - Your lender will send you and your conveyancer the mortgage offer. The conveyancer is responsible for explaining the terms and conditions of your mortgage offer. The Contract documentation and Mortgage Deed will then be sent to you for approval and signature. Exchange of contracts - Exchange of contracts takes place between the two parties' conveyancers, usually by telephone. Following exchange, your signed contact is forwarded to the other party's conveyancer and they in turn will send their party's signed contract to your conveyancer. At this stage, you and your seller/buyer will be legally committed to the transaction. Prior to legal completion, your conveyancer will require any monies due to them to be cleared funds in time for legal completion. They will deduct their fees and disbursement costs and stamp duty from the balance at legal completion. Finally, you will liaise with your agent for the release of the keys to the property. 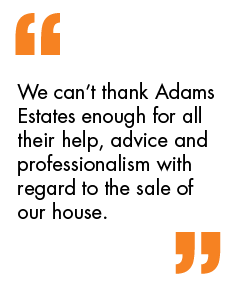 This is where Adams Estates can help you. We work with our own recommended solicitors and our solicitors combine a personal service together with state of the art technology to ensure that you are kept informed throughout the process of the transaction. We have worked with these solicitors for a number of years, and we know that they provide a professional service, and results you can trust.